Yes, I hosted this round of Cook the Books (the best virtual foodie book club going ten years strong!) and yes, I am posting (as per usual), right before the deadline. 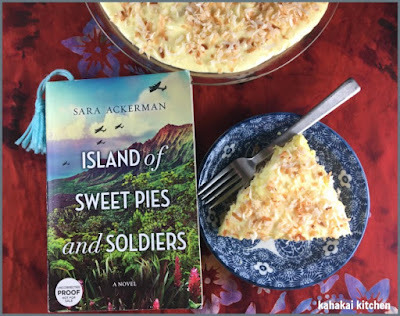 ;-) Having been on the TLC Book Tours Instagram Tour for Island of Sweet Pies and Soldiers by Sara Ackerman last year, I was more than excited to make it our December/January selection. 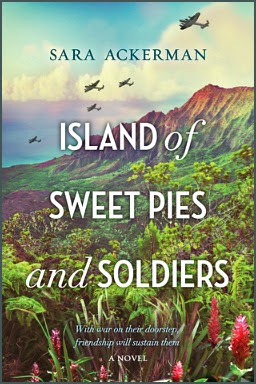 Historical fiction set during World War II is my jam, and the fact that this novel is set on the Big Island of Hawaii made it an obvious pick as I have been long wanting to host a Hawaii-based book for our group. My book-inspired dish, Tropical Pineapple Pie, gave me a chance to crack open a cookbook that was given to me when I started my new job in August. But first, let's talk about the book. 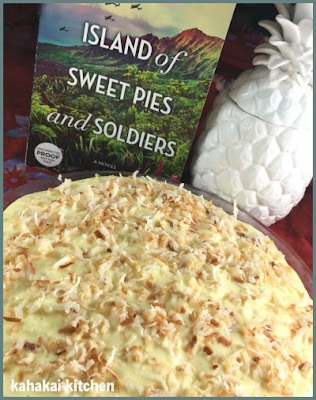 Island of Sweet Pies and Soldiers is a touching and engaging story about Violet, a teacher in the small community of Honoka'a, Hawaii (north of Hilo) dealing with the effects of the war on her community and the disappearance of her husband the year prior. Violet is especially worried about her daughter, Ella, who is withdrawn and suffering and seems to know something about what happened to her father. Violet and her friends (roommate and fellow teacher Jean and Japanese Setsuko, whose husband has been taken away to a internment holding area on the island) band together to make and sell pies to the soldiers who are stationed on the island as they prepare to be shipped out to battle. Author Sara Ackerman was born and raised in Hawaii and she paints a vivid picture of wartime life and the impact on the islands. The story is told from both Violet's and Ella's points of view and mother and daughter are likable characters that are easy to root for, as are their friends and the supporting characters of soldiers and townspeople. The book has secrets, drama, romance and friendship, not to mention a pet lion named Roscoe and lots of pie. Since I read a lot of World War II-set novels, I loved this glimpse of Hawaii at war that isn't centered around Oahu and Pearl Harbor (although I am very much looking forward to Ackerman's second book, The Lieutenant's Nurse, due out in March that is set on Oahu and on the attack and its aftermath). Although the pies that Violet and her friends bake and sell to the soldiers (especially the chocolate honeycomb pies and coconut sweet potato pies) are a focus of the food in the book, there was plenty of other food to be found including coconuts, vanilla ice cream, corn, pineapple, Okinawan sweet potatoes, coffee, banana pancakes, cornflakes, rice balls, mint, sweet potato soup, okolehao (Hawaiian moonshine), rice cakes, poi, chocolate pudding, kale, tomatoes, lettuce, eggplant, cucumber, meatloaf with sauce and sage, sushi made with canned sardines, Spam casserole, passion-orange juice, peanuts, Saloon pilot crackers with chunks of salted codfish, creamed corn, beef stew and white rice, Spanish casserole, roasted fall vegetables, hamburgers, manapua, chop suey, porridge, malasadas (Portuguese donuts), steak fry, tomatoes, musabi, ginger, guava, chicken hekka, honey, sugarcane lemonade, Coca Cola, chili and rice, ham sandwich with pickles, tomato, lettuce and onion, Spam sandwiches, red potato salad, apples, papio (fish), taro, and watercress (slightly steamed and sprinkled with sea salt), opihi (shellfish) ohelo berry pie, mashed potatoes, roast pig,cornbread stuffing casserole, pumpkin pie, frosted gingerbread men, champagne, roasting marshmallows, toast with grape jelly, lemon baked ahi, steak and eggs, and lilikoi (passion fruit). 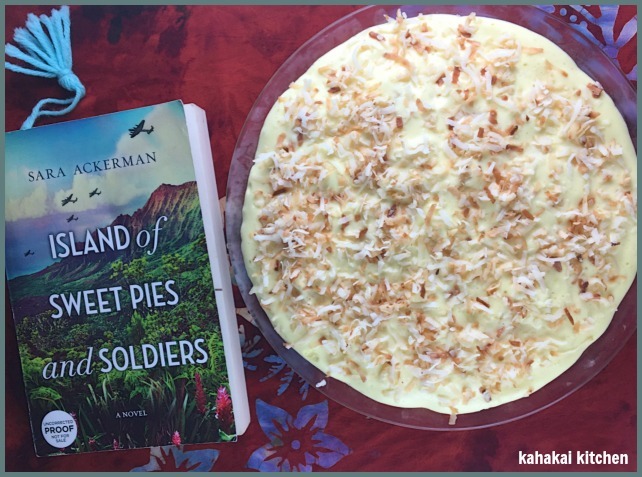 I'm not much of a baker or a pie maker, but it was what was calling me for this book so I popped open a few of my Hawaii cookbooks and looked for easy, no-bake pies. 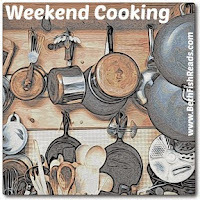 My team had three cookbooks at my desk when I started my job in August and I found a couple of likely recipes that had the right vibe in Celebrating in Hawai'i: Favorite Recipes for Holidays and Special Occasions by Muriel Miura and the Star Advertiser. 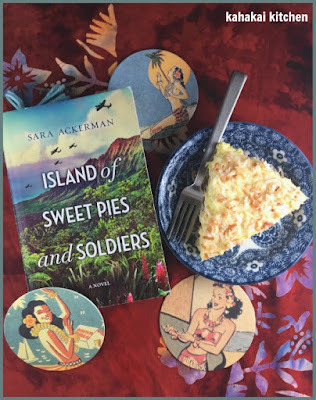 I went back and forth between a Guava Chiffon Pie and the Tropical Pineapple Pie which finally won out because of Mr. Macadangdang's trucks full of coconuts and the mentions of pineapples in the book. The pie had a bit of a retro feel to it and I liked the idea of the toasted coconut crust. Brown coconut in butter, stirring constantly over moderate heat. Reserve 2 tablespoons for topping. Press remaining mixture onto bottom and sides of 10-inch pie pan, Set aside to cool. Drain pineapple and pour syrup and lemon juice into a small saucepan. Set pineapple aside. Beat together sugar, eggs, and salt. Stir egg mixture into pineapple syrup until well-blended. Cook over moderate heat, stirring constantly until mixture comes to a boil. Add gelatin and stir until dissolved. Stir in pineapple and chill until mixture begins to thicken. Beat egg whites, dry milk, and water until soft peaks foam. Fold into chilled mixture and pour into coconut crust. Garnish top with reserved coconut flakes; chill until set, about 4 hours. Notes/Results: I was drawn to the recipe because of its old-fashioned feel and I love the way it looks, but flavor-wise, it was only okay for me. I wanted a stronger pineapple taste. The toasted coconut crust was my favorite part although I had to improvise a bit when I couldn't find canned coconut at my grocery store. 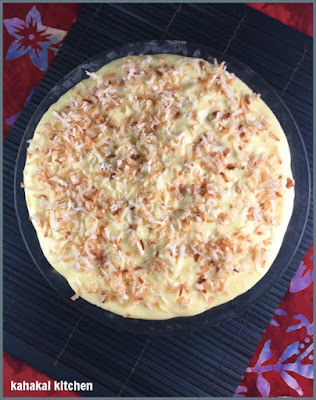 Without canned, in order to get the toasted dried coconut to stick together enough to form the crust I added sweetened condensed coconut milk to it, pressed it into the pie pan and broiled it for a couple of minutes to get it to hold together. It made for a chewy, toasty crust that went well with the filling and that I would use again. Island of Sweet Pies and Soldiers is my first foodie book entry for the Foodies Read 2019 event. You can check out the January 2019 Foodies Read linkup, hosted by Heather at Based on a True Story, to see what everyone is reading this month. The deadline for this round of CTB is Thursday, January 31st and I'll be rounding up the entries on the Cook the Books site soon after. If you missed this round and like food, books, and foodie books, join us for February/March when we'll be reading Crazy Rich Asians by Kevin Kwan, hosted by Claudia of Honey From Rock. Posted mine this morning so you wouldn't be the last one up! :) Love the pie. It was hard not to choose a pie for this round. I love that you did this!! Great review and recipe, as always. The Food of Paradise: Exploring Hawaii's Culinary Heritage (A Kolowalu Book) by Rachel Laudan is my favorite Hawaiian cookbook. I love reading about Hawaiian food — your list of foods is great. I wonder how carefully the author researched the foods that were really available in that era. Thanks for this taste of home on a cold winter's day in Virginia! You've definitely made me want to read the book, and your list of foods makes me crave manapua, chicken hekka, anything Spam, and malasadas -- all foods I grew up with. The pineapple pie with coconut crust sounds yummy. Haven't heard the name Muriel Muira in a long time and remember her recipes from the newspaper. This pie sounds delicious. Thanks so much for hosting this month. I loved this novel. Oh Boy!! I could go for a nice piece of that pie. Great pic on the book Deb. I am also intrigued by the crust! I am wondering though: flaked coconut is dry and usually sold in sealed bags. Is the canned version fresh?